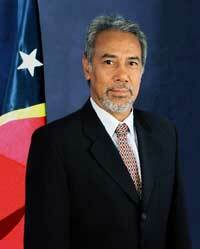 Kay Rala Xanana Gusmão was born on June 20, 1946 in Manatuto, Timor-Leste (East Timor). He was raised in the country, with a brother and five sisters. His father was a schoolteacher. He completed primary and started secondary school at the Catholic mission of "Nossa Senhora de Fátima" in Dare and then went on to Dili. He started to work very early in life, mornings as a chartered surveyor and afternoons teaching at the Chinese school. In April 1974 he joined the staff of "A Voz de Timor" (the Voice of Timor). After the Carnation Revolution in Portugal on 25th April 1974, and faced with the opportunity for self-determination and independence, Kay Rala Xanana Gusmão decided to join the newly formed Associação Social Democrata –ASDT (Social Democrat Association) which was later that same year transformed into the Revolutionary Front for an Independent Timor-Leste (FRETILIN). Having worked as a journalist and photographer, Kay Rala Xanana Gusmão took on the party’s job of Deputy-Director of the Department of Information. On December 7, 1975, after a series of border-armed incursions into the territory of Timor-Leste, Indonesia decided to invade the capital, Díli. Following the death of the then President of FRETILIN, Nicolau Lobato in December 1978, and coupled with the loss of a majority of the Central Committee Members of FRETILIN, Kay Rala Xanana Gusmão was left with the task of reorganising the struggle. In March 1981, he organised the first National Conference of the FRETILIN, during which he was elected leader of the Resistance and Commander-in-Chief of the FALINTIL (National Liberation Armed Forces of Timor-Leste). In March 1983, Kay Rala Xanana Gusmão demonstrated his pragmatism by initiating formal negotiations with the Indonesian Armed Forces (ABRI/TNI) leading to a cease-fire, which lasted until August the same year. He conceived and implemented the Policy of National Unity that translated into active cooperation with members of the Catholic Church and with the transitional authorities of Timor-Leste. Kay Rala Xanana Gusmão took advantage of the five-month cease-fire to develop the first organised national clandestine network, known in Portuguese as ‘Frente Clandestina’. In 1988, the success of the initiative for National Unity prompted Kay Rala Xanana Gusmão to create the CNRM - National Council of Maubere Resistance, as an expression of a non-partisan national command of the struggle; CNRM later became CNRT, National Council of Timorese Resistance. A year after the Santa Cruz massacre, Kay Rala Xanana Gusmão, after 17 years of guerrilla warfare, was captured on November 20, 1992 in the capital Díli. Faced with international commendation, Kay Rala Xanana Gusmão faced a kangaroo-court trial and was imprisoned in a prison reserved for criminals only, but amid pressure from the international community, the Indonesian authorities were forced to transfer him to Cipinang prison reserved for political prisoners. In prison, Xanana Gusmão devoted his time to the elaboration of the strategies of the Resistance, while studying Bahasa Indonesia (the Indonesian language), English and Law. He also painted and wrote poetry, cultivating a talent already recognised in 1975 when he won the Timor Poetry Prize with his poem “Mauberíadas”. Some of his paintings were sold, the payment of which was donated to the Resistance at Xanana Gusmão's request. In 1994, some of his political essays were published in a book, Timor-Leste - um Povo, uma Pátria, (East Timor - a People, a Nation) Ed. Colibri, Lisbon. In April 1998, at the East Timorese National Convention in the Diaspora, which established the National Council of Timorese Resistance (CNRT), Xanana Gusmão was reaffirmed by acclamation as leader of the East Timorese Resistance and President of CNRT. Following increasing international pressure to release him and the statement by President Habibie of Indonesia on granting independence to Timor-Leste if the outcome of a popular consultation was to reject the autonomy plan proposed by his government, Kay Rala Xanana Gusmão was transferred from Cipinang Prison to house arrest in Salemba, Central Jakarta, on 10 February 1999. The rapid development of the East Timorese political process and the generalised international recognition of Gusmão's statesmanship and leadership were the reasons for the numerous visits to his prison-house by foreign government representatives, including US Secretary of State, Madeleine Albright, former US President, Jimmy Carter, Australian Foreign Minister, Alexander Downer, and Japanese Foreign Minister, Masahiko Komura. The UN-sponsored referendum on 30 August 1999, which overwhelmingly rejected the autonomy proposal put forth by Indonesia, signalled the end of the Indonesian occupation of Timor-Leste and the beginning of the transitional process led by the UN in Timor-Leste. This was undoubtedly the first democratic act in Timor-Leste’s history. Kay Rala Xanana Gusmão was released from house arrest on 7 September 1999. In August 2000, the First National Congress of CNRT, held in Díli, elected Kay Rala Xanana Gusmão President of the CNRT/National Congress. From November 2000 to April 2001, Kay Rala Xanana Gusmão was the Speaker of the National Council, an all-Timorese legislative body of the Transitional Administration of East Timor, comprised of political party, civil society representatives, pro-autonomy groups and representatives from several religious beliefs. The CNRT/CN was dissolved on 9 June 2001. After the dissolution of CNRT/CN, Kay Rala Xanana Gusmão focused his efforts on the AVR – Association of Resistance Veterans, - an organisation that encompasses former members of the clandestine network and aims to create conditions for their skilled participation in the country’s development process. On 14 April 2002, Kay Rala Xanana Gusmão was elected President of Timor-Leste and was sworn-in as the President of the Democratic Republic of Timor-Leste on 20 May 2002. He served as President of the Republic until the end of his term of office in May 2007. After leaving the Presidency, Kay Rala Xanana Gusmão was elected President of the newly established political party formed in April 2007, CNRT - "National Congress for the Reconstruction of Timor-Leste". For the whole month of June, Kay Rala Xanana Gusmão campaigned during the legislative elections across the country. On 30th June, the legislative elections were held and in the final results, CNRT received the second highest number of votes and immediately formed an alliance with three other parties - PD (Democratic Party) and the ASDT-PSD Coalition called the AMP (Alliance with Parliamentary Majority), thus securing 37 out of the 65 seats in the National Parliament. On 3rd August 2007, H.E. Dr. José Ramos-Horta, President of the Republic, officially invited the AMP to form the next Government. On 8th August 2007 at the Lahane Presidential Palace, the IV Constitutional Government was sworn-in with Kay Rala Xanana Gusmão as Prime Minister of the Democratic Republic of Timor-Leste. The Government’s term of office ends in 2012. On 7th July 2012, legislative elections were held and CNRT received the highest number of votes, securing 30 seats out of the 65 seats in the National Parliament. CNRT formed a coalition with PD and Frente-Mudança bringing the total number of seats held by the three party Coalition Block to 40. The Coalition Block was invited by the newly elected President of the Republic, H.E. Taur Matan Ruak, to form the next government and on 8th August 2012, the V Constitutional Government was sworn-in, exactly five years after its predecessor. Kay Rala Xanana Gusmão was sworn-in as Prime Minister for a second five year term. The Prime Minister was also sworn-in as the Minister for Defense and Security on 22 October 2012.